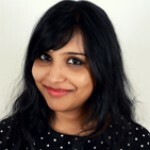 Wall Sit Exercise – How To Do And What Are Its Benefits? Wall sit exercises are great for sculpting the thighs, hips, calves, and lower abs. These exercises are easy on your knees and back and can be done by anyone. Do 20 minutes of wall sit exercises a day to strengthen and tone your calves, quads, hamstrings, glutes, and core and lose belly fat. In this article, you will learn the correct technique to do wall sit exercise and 10 modified wall sit exercises to tone your entire body. So, instead of rigorous running and signing up at a gym, let’s learn to wall sit. Read on! What Do You Need To Do Wall Sit Exercise? Like any other exercise, the wall sit exercise should be done with precision for it to work. So, here’s a step by step representation of how a wall sit exercise should be done. Lean against the wall with your feet shoulder-width apart and firmly planted on the ground. This is your starting position. Engage your core and put your feet forward. Go down as you do so, and keep leaning against the wall. Your feet should be 6 inches apart. Slowly slide down the wall with your back pressed against it until your legs are bent at a right angle. This angle is very crucial because if your thighs are not parallel to the ground, your muscles will not get a good workout. Ensure your knees are directly above the ankles and do not overshoot them. Hold this position for 20-30 seconds. Gradually, increase the hold time to 60 seconds. After you finish the last rep, come back to the starting position. Do 3 sets of 10 reps or follow your trainer’s instructions. So, this is how easy the wall sit exercise really is! It is super effective, burns calories, helps to tone the muscles, and is fun. But traditional wall sit exercises are only for the lower body. What if you want to tone the whole body? Well, we have a solution – modified wall sit exercises. Here are 10 wall sit exercises to tone your entire body. Quads, hamstrings, calves, glutes, deltoids, lats, rotator cuff muscles, abs, biceps, and wrist extensors. Lean against the wall with your feet shoulder-width apart and firmly planted on the ground. Hold the dumbbells to your sides with the palms facing your body. Keep your elbows slightly bent and core engaged. Put your feet forward. Go down as you do so, and keep leaning against the wall. Your feet should be 6 inches apart. This is your starting position. Exhale and slowly slide down into the perfect wall sit position and raise your arms until they are at level with your shoulders and parallel to the floor. Hold this position for a second and then inhale and slide up by straightening your arms. Simultaneously, lower your arms and come back to the starting position. Lat raises with wall sit will help tone your upper body and abs without straining your knees or back. Keep your back straight and do not move away from the wall. Quads, hamstrings, calves, glutes, deltoids, biceps, wrist extensors and flexors. Lean against the wall with your feet shoulder-width apart and firmly planted on the ground. Hold the dumbbells to your sides with the palms facing forward, elbows close to your torso, and core engaged. Put your feet forward. Go down as you do so, and keep leaning against the wall. Keep your feet 6 inches apart. This is your starting position. Now, exhale and slide down into a perfect wall sit position. Keep your upper arms stationary, flex your elbows, and bring both your forearms up until the dumbbells are close to your shoulders. Hold this position for a second and then exhale and slide up the wall. Simultaneously, lower your forearms and straighten your arms. Do 2-3 sets of 10 reps. 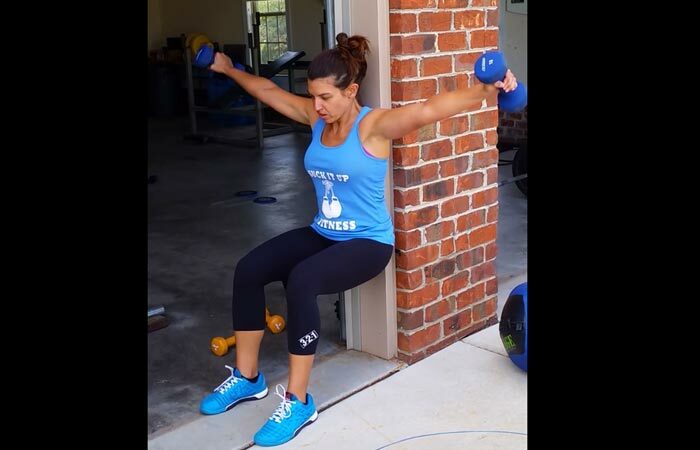 This modified wall sit exercise will help tone your upper arms. You can also do this exercise with a barbell. Quads, hamstrings, calves, glutes, anterior deltoids, posterior deltoids, lateral deltoid, and lats. Lean against the wall with your feet shoulder-width apart and firmly planted on the ground. Hold the dumbbells and flex your elbows to level your upper arms with the shoulders, palms facing forward, and the upper arms at a right angle with the forearms. Now, exhale and slide down to a wall sit position. Simultaneously, raise your arms so that they are fully extended and are directly above your head. Hold this position for a second. Now, inhale and flex your elbows, lower your arms, slide up while leaning against the wall, and come back to the starting position. 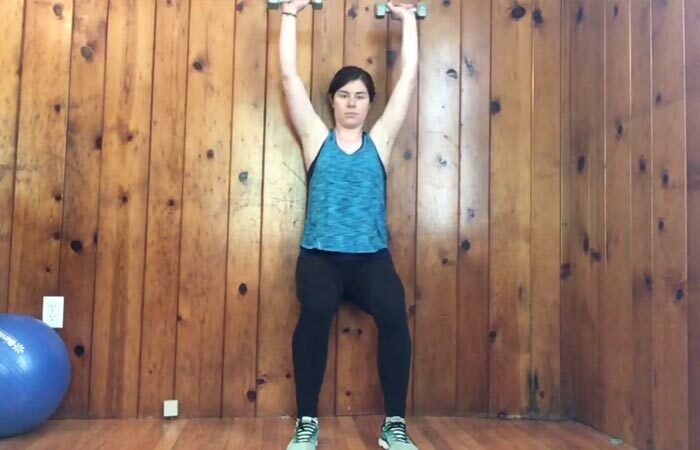 Tone up your shoulders and upper body with the wall sit shoulder press exercise. Keep your core engaged while doing this exercise. Quads, hamstrings, calves, adductors, glutes, upper abs, and lower abs. Lean against the wall with your feet shoulder-width apart and firmly planted on the ground. Slide down to a wall sit position. Extend your right leg in the front. Inhale and slowly lower your leg. Stabilize yourself in the sitting position. Exhale and repeat this with the left leg. Do 1 set of 10 reps. This takes the traditional wall sit exercise to a higher level and helps you gain muscle strength and stamina. Your extended legs should be at the same level as your hips. Put your feet forward and go down as you do so. 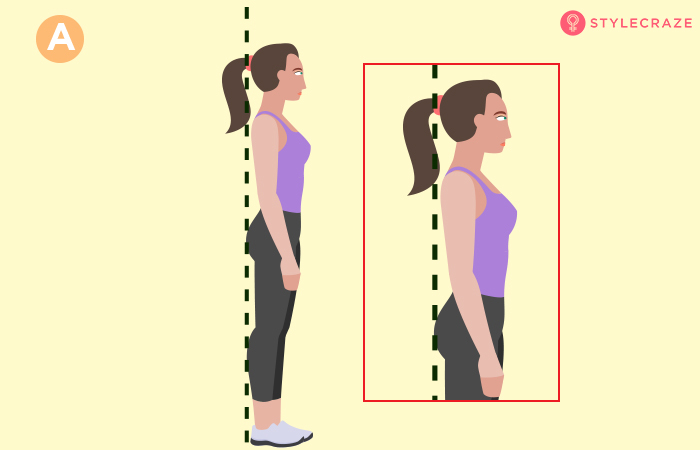 Keep leaning against the wall and place your feet 6 inches apart. This is your starting position. Slide down to a wall sit position and be comfortable. Exhale and alternately lift the right and left legs up to your chest – as if you are marching. 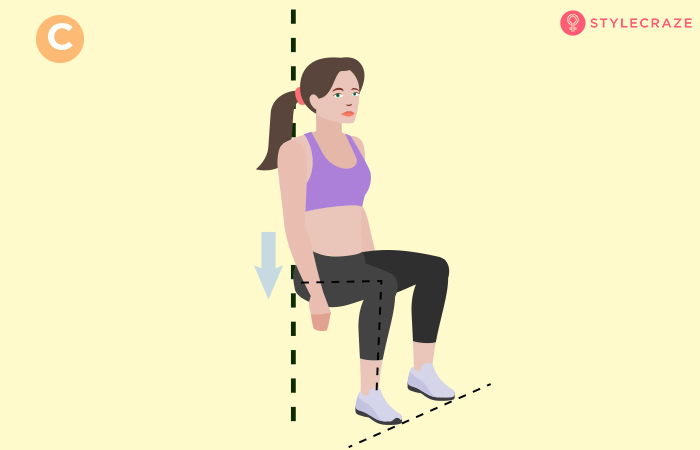 This wall sit exercise will help tone your thighs. Make this exercise intense by further lowering your body. Slide down to the wall sit position or chair position, and engage your core. Raise both your heels and hold this position for 5-10 seconds. Release the hold, lower your heels and repeat. It will help strengthen your calves and tone your thigh muscles. As you progress, make sure to increase the duration of the hold. Quads, hamstrings, calves, adductors, glute, and core. 1. Tie a resistance band around your thighs. 2. Lean against the wall with your feet shoulder-width apart and firmly planted on the ground. 3. Put your feet forward. Go down as you do so, and keep leaning against the wall. Keep your feet 6 inches apart. This is your starting position. 4. Now, slide down and come to a sitting position and widen your legs as you do so. 5. Slide back up the wall and come to your starting position. If you have jiggly inner thighs, this exercise will help you lose the fat and tone up. If you don’t have a resistance band, use a belt. Adductors, core, glute, quads, hamstrings, and calves. Put your feet forward and go down as you do so. Keep leaning against the wall. Your feet should be 6 inches apart. Place a medicine ball between your knees. This is your starting position. Slowly slide down and squeeze the medicine ball. Hold this position for a second and come back to the starting position. This will help in reshaping your inner thighs. If you don’t have a medicine ball, fold a pillow and use it. Upper abs, lower abs, glute, quads, hamstrings, and calves. Lean against the wall. Keep your feet shoulder-width apart and firmly planted on the ground. Put your feet forward and go a little down. Place your feet 6 inches apart. Cross your arms and keep them at your chest level. This is your starting position. Now, slowly slide down and hold the chair position for 10 seconds. Exhale and slide up back to the starting position. Not supporting your body by keeping your arms against the wall helps in intensifying this exercise. It helps tone your belly, buttocks, and thighs. You can hold a medicine ball instead of crossing your arms. Quads, hamstrings, calves, adductors, lower back, and glutes. Place a stability ball between you and the wall. Keep your feet shoulder-width apart and firmly planted on the ground. Put your feet forward and go a little down. Ensure that your feet are 6 inches apart. You can either do a bicep curl or shoulder press or use a resistance band. Slowly go down, making sure you balance the stability ball so that it doesn’t slip and fall. Hold the chair pose for 10 seconds before sliding up to the starting position. This exercise teaches your muscles about balancing and stabilizing the body. Moreover, it is a great exercise for toning the hips and legs. You can use a foam roller instead of a stability ball. There you go – 10 modified wall sit exercises to help you tone the entire body. Now, let’s look at the benefits of doing wall sit exercises. Primarily, wall sitting builds your isometric strength and endurance in the glutes, calves, and quadriceps. The muscles present in the front of your thighs are the quadriceps. One of these four is the rectus femoris, which helps to move your thigh and torso closer. Doing wall sits increases the strength and endurance of this muscle. The hamstring muscles located in the back of the thighs work in rhythm with the quadriceps. Wall sits also strengthen the hamstring muscles. The adductor muscles present in the inner thighs can also be strengthened with wall sits. Wall sits are often done before the skiing season to increase the strength of the legs. As wall sits separate out the quads, they do not provide an overall workout. 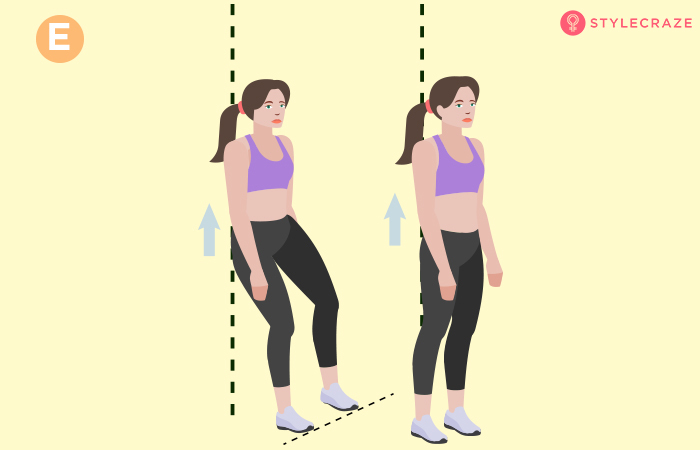 So, they have to be done in combination with other exercises that bulk up the quad muscles, like walking lunges and some basic plyometric exercises. If all of these are done regularly, you will be able to take part in activities like skiing without any problem or discomfort. To conclude, wall sit exercises are easy and beginner-friendly. You can add intensity to these exercises by modifying them according to your need. Try these versatile and effective exercises and get that shapely body that you so long for. Good luck!